North Korean vice foreign minister, Han Song-Ryol, told the BBC that Pyongyang will continue to test missiles on a “weekly, monthly and yearly basis” and that if the US were to take military action an “all-out war” would result. And, as the New York Times ’ Jane Perlez reports , Vice President Mike Pence warned North Korea today while visiting South Korea not to test American resolve, but he also raised the possibility that the Trump administration could pursue talks. Dive Deeper: See CSIS’s “Beyond Parallel” micro-website for its latest prediction, “Uptick in Likelihood of North Korean WMD Activity,” which indicates there is a 58% likelihood of North Korean weapons of mass destruction (WMD) activity taking place in the next 14 days. In the next 30 days, there is an 84% chance for North Korean WMD activity. And see the Korea Institute at SAIS’s “38 North” for satellite imagery of North Korea’s Punggye-ri Nuclear Test site. A defiant Turkish president Tayyip Erdogan denounced the West’s “crusader mentality” today after European monitors criticized a referendum to grant him sweeping new powers, which he won with a narrow victory laying bare the nation’s divisions, as Reuters’ Gulsen Solaker and Daren Butler report. Images of protesters in Caracas running through clouds of tear gas and bloodied by state security forces have been front and center in recent media coverage of Venezuela. Other cities around the country also have been hit hard by police, national guard troops and the regime’s paramilitary forces as the dictatorship of Nicolás Maduro tries to contain a wildfire of rebellion, as the Wall Street Journal’s Mary Anastasia O’Grady reports. Dive Deeper: See a report published today by CSIS’s Katherine Bliss: Meeting Basic Health Needs in a Venezuela in Crisis. The percentage of Turkish voters who voted in favor of the constitutional referendum. Source: CNN. —CSIS’s Bulent Aliriza on the impact of Turkey’s referendum. Missile Threat, an interactive website from CSIS’s Missile Defense Project, is an authoritative source of information and analysis about ballistic and cruise missiles around the globe and the systems designed to defend against them. 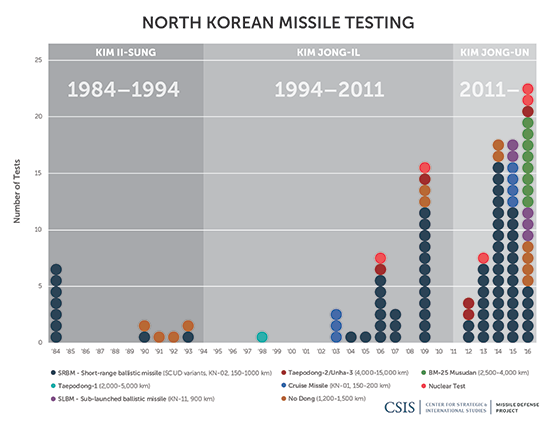 This graph shows how North Korean missile testing has changed since Kim Il-Sung. 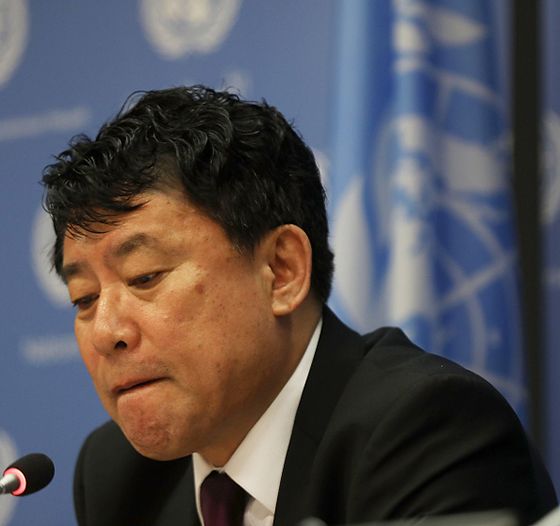 Deputy UN Ambassador Kim In Ryong of North Korea speaks to the media today in New York. “War, Terrorism, and the Christian Exodus from the Middle East,” by Robin Wright for the New Yorker. Join CSIS’s Freeman Chair in China Studies at 3:00 p.m. for a book forum on The Souls of China: The Return of Religion after Mao, by Pulitzer Prize-winning journalist Ian Johnson. Join the Atlantic Council’s Global Energy Center at 12:00 p.m. for the report launch of Reform of the Global Energy Architecture. Last month, CSIS’s Japan Chair hosted the 2017 U.S.-Japan Security Seminar, featuring a discussion on the U.S.-Japan alliance and the new U.S. administration. The latest from CSIS’s Take as Directed podcast analyzes the outcomes of Consortium of Universities for Global Health’s (CUGH) 8th Annual Global Health Conference last week. You can listen on iTunes or SoundCloud. Sheryl Crow always makes me smile. She writes catchy songs and always puts together terrific bands to perform with. Her new single “Be Myself” is no exception. It comes out Friday along with her 10th album. Major artists like Crow are doing all kinds of innovative things to promote their music in the digital age. Today, Crow released a performance of “Be Myself” as a preview of an upcoming concert special.